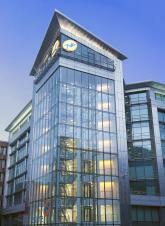 Equinox is an office development in the centre of Glasgow which extends to 64,000 sq ft over eight floors. It was designed by G D Lodge and built by Wilson Bowden Developments in partnership with Taylor Clark Properties. The development was let to insurance company esure ahead of its completion in 2002 and was sold to an investor from Hong Kong.